Home / Online Deals / Back To School Deals / Back to School Backpack Deals | High Sierra Backpacks as low as $18.38! Back to School Backpack Deals! Take a look at this year’s cheapest Backpacks for Back To School! I have more Backpack Deals for you for Back to School!!! I will be updating this page with more Back to School Backpack Deals this year, so make sure you check back for all the latest and greatest prices on cheap backpacks. Find options for young kids, as well as Laptop Backpacks for your older ones! For one day only, you can get High Sierra Backpacks for as low as $18.38! Select styles are on sale, and then they have some patterns down to crazy prices! The High Sierra Loop Backpack comes for the price of $18.38 in select patterns, so click around and see if the pattern you want is on sale. You will also find the High Sierra Loop Backpack in Black for just $18.99! The High Sierra Chaser Wheeled Laptop Backpack is down to only $38.22 in some of the patterns! Hurry over to Amazon where, for one day only, you can get cheap High Sierra Backpacks! I have some more great deals on Backpacks and Lunch Bags for you at The Children’s Place! I am currently seeing Backpacks under $10 and Lunch Bags under $4! There are several different prints of Backpacks for $9.99 like this Contrast Leopard Print Backpack! Okay, this is such an amazing offer on high quality backpacks! 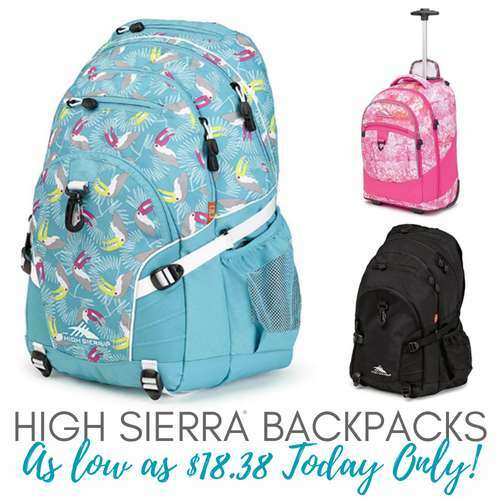 High Sierra has a HUGE Clearance Sale on Backpacks today with prices as low as $15.99 and FREE Shipping! I also see the High Sierra Pinova Backpacks in three colors for $15.99. The popular High Sierra Fat Boy Backpacks are down to just $17.99, and they are a great backpack for teens or college students. You can also get their matching Lunch Bags for only $7.99! I don’t know how long this Clearance Sale on Backpacks will last, so order yours now and put it away for your kiddo for school! Your information about the City Streets backpacks and lunch bags at JC Penney is incorrect. The discount does not apply to those products. 24DEALS code would not work for the city street backpacks at JCPenney.com. Looks like the lowest price is $7. The JCP site really doesn’t make that clear until you get to the cart. It even says $5.25 after coupon, but if you enter that coupon it says City Streets is not included in deal. Either there’s a glitch on their website or it’s false advertising. Men’s NCAA Hoodies On Sale for only $24.99! 24 Custom Halloween Stickers & Treat Bags just $10.90 Shipped!